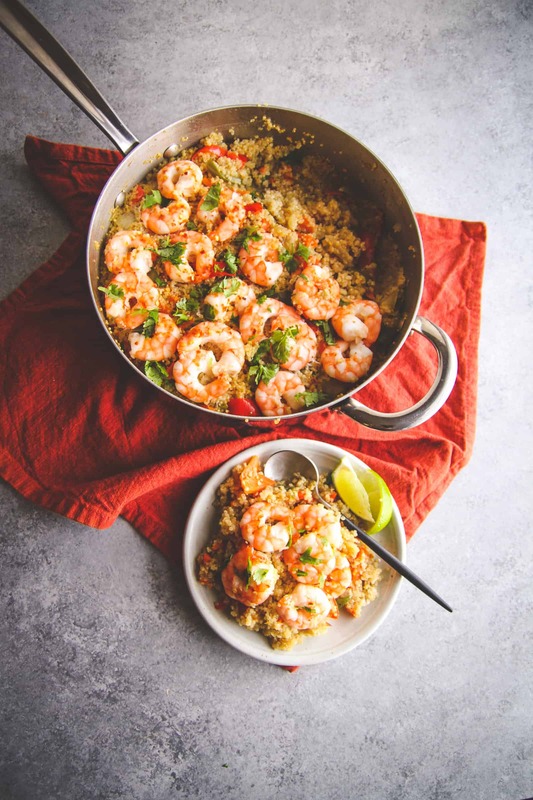 Made in one pot, this Thai shrimp and quinoa will soon become a family favorite meal. It’s healthy, protein-filled, and so incredibly delicious! And did I mention it’s made in one pot? It’s so easy to make and clean up is a breeze! Thank you to Bob’s Red Mill for sponsoring this post. Be sure to check out BobsRedMill.com for more delicious healthy recipes, coupons and to find stores carrying products near you. I feel it’s only fair that I let you guys in on what’s been happening in my kitchen and to my eating habits since I’ve become pregnant. It’s been really tough for me. It’s been tough to get it together enough to cook, and then usually something or other makes me feel not so good, and I end up not wanting to eat what I’ve made, or not even being able to finish more than one or two bites. Instead of craving everything, it’s been tough to find things I can actually stomach. And even though I’m not vegetarian, I’ve been eating very little meat, so I was getting worried that I wasn’t getting enough protein. 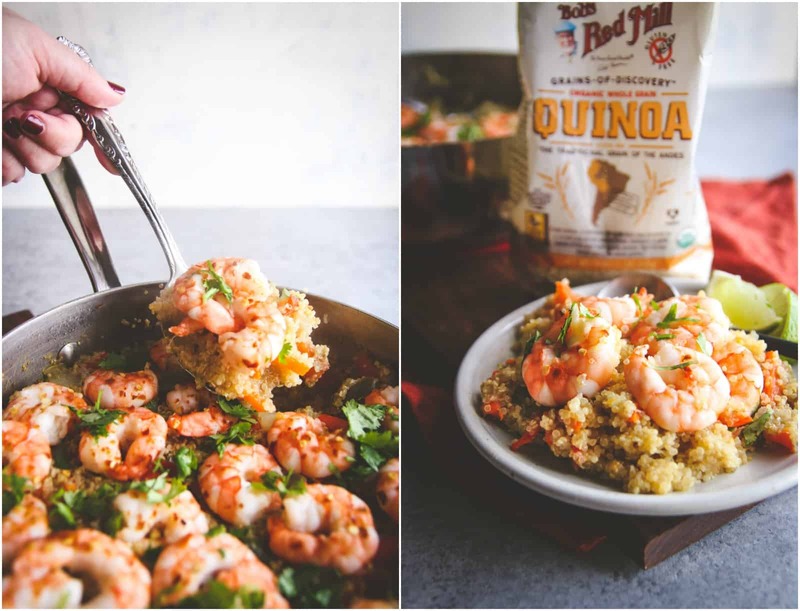 Knowing that quinoa is one of the most protein rich foods one can eat, I set out to make a recipe using it, and of course whenever I’m using grains, I’m using Bob’s Red Mill brand (like when I made this 5 ingredient slow cooker salsa chicken and quinoa). Quinoa is one of those grains I simply do not use enough. It has a very very very mild flavor, so it’s great for infusing flavors into. I thought of bold Thai flavors of coconut and various spices. It smelled so good when I was cooking it, I didn’t even want to leave the kitchen, but this dish is super low maintenance to make, so one doesn’t need to babysit it. 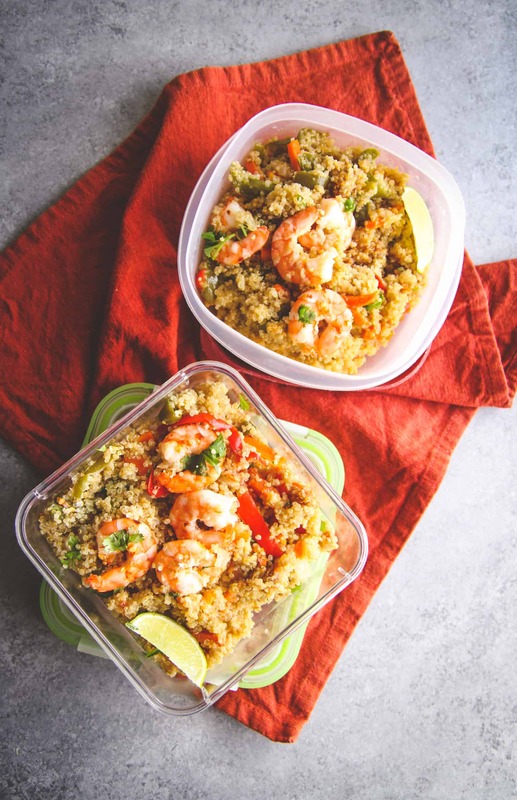 This one-pot Thai quinoa and shrimp recipe is great for leftovers (if there are any) because it reheats really well, so meal-prepping is made easy! 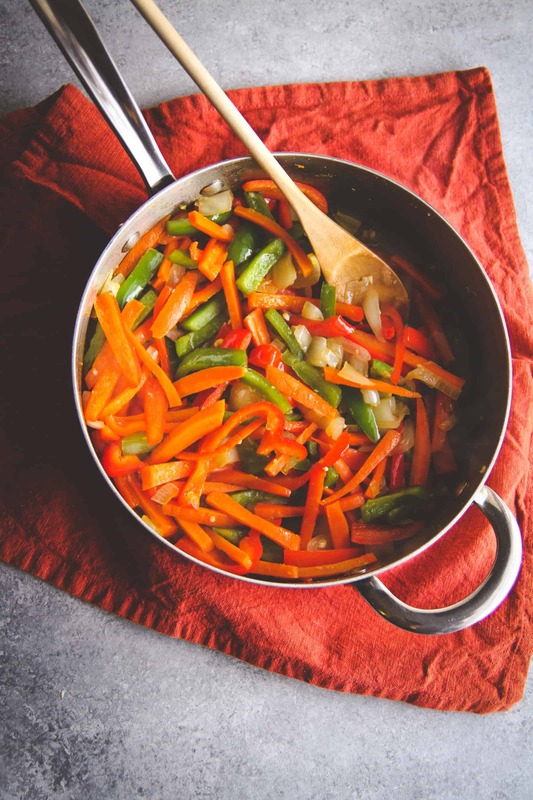 In a large skillet that has a lid (mine is a 3 quart pan), add coconut oil, fish sauce and sesame oil and cook on medium-high for 30 seconds, then add in the onion, bell pepper slices, and carrots, season with ginger, and salt. Cook for 4-5 minutes, stirring ocassionally until the vegetables are starting to soften. Add in the garlic and cook for 30 seconds, then pour in coconut milk, chicken stock and quinoa. Stir well, cover, and cook for 15 minutes (without removing the lid or stirring). After 15 minutes, remove the lid, stir once, then nestle the shrimp on top of the qunioa and vegetable mixture. 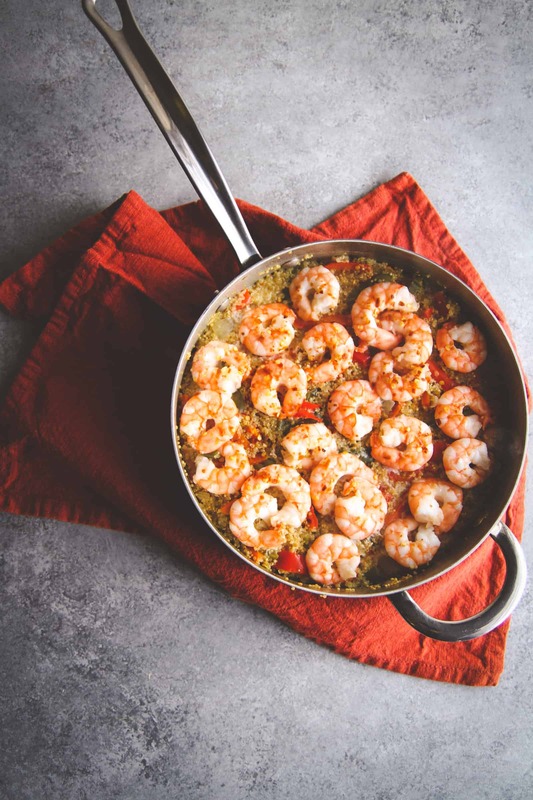 Sprinkle salt and red pepper flakes and cover and cook for an additional 5 minutes, until the shrimp is cooked through. Remove from heat. 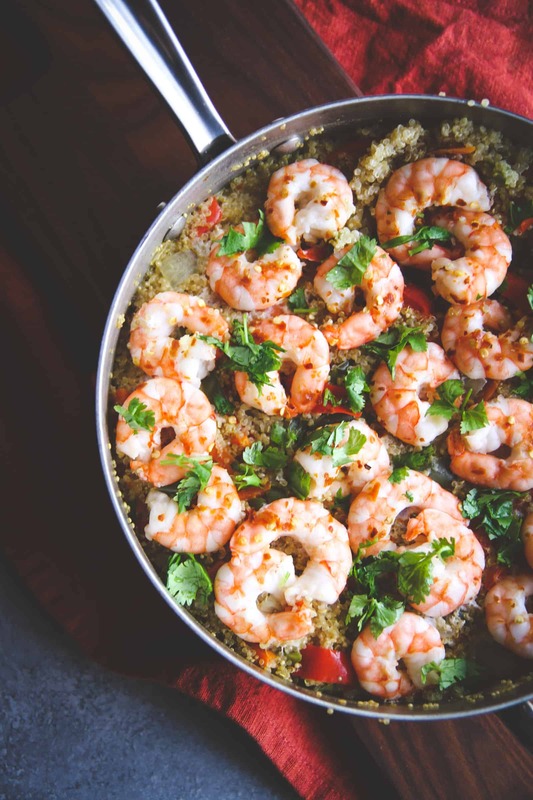 Squeeze lime wedges on top of the shrimp and sprinkle with cilantro, then serve and enjoy. Thank you so much, I think you’d love this dish! 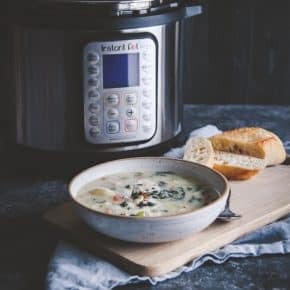 This looks great and I love that it’s one pot! Bobs Red Mill is definitely a favorite! One pot meals are a total mess saver, aren’t they? And I’m so in love with Bob’s Red Mill products too, so glad to hear you are as well! I think you’d absolutely love this dish Marina, it was honestly one of the best things I’ve ever made, and I’ve made it three times in the last three weeks lol! 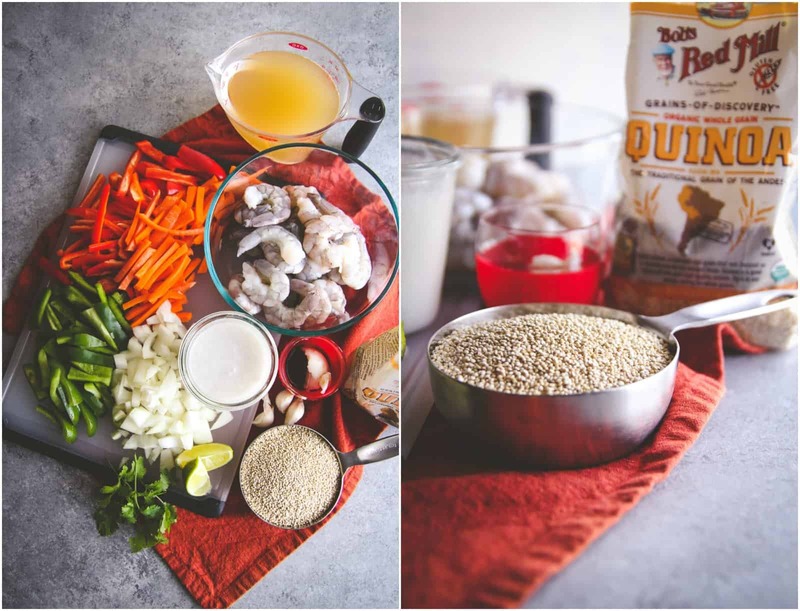 I’m making this tonight but just want to check: The ingredient list says “fish oil” but the recipe says “fish sauce” … I have to imagine the you meant “fish sauce,” right? oh my goodness, so sorry for the mix up, it’s definitely fish sauce! First of all, this is DELICIOUS! Second, it’s super healthy, and third it’s something very different! Exceptional work dear Phi!!! Can’t wait to give this a try! Thank you! PS The green “Pin it” button on mouse-over the photo doesn’t seem to be working at the moment:( We wonder if it’s something happening on this computer only. 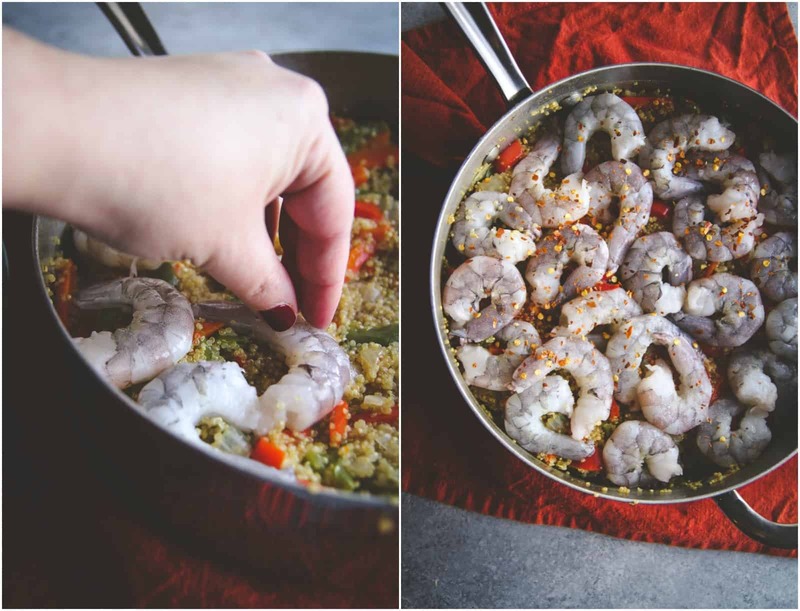 This one pot dish is one of my absolute favorites lately, I think you’d love it! And thank you for the PS. I don’t have a mouse-over pin button on my site, so perhaps that is something installed on your computer? The image is one that can be clicked, but no mouse over, thanks! One pot meals are everything. especially when their complete with protein, carbs and fat like in this dish! This looks so flavorful! Thank you so much Bethany, one pot meals are definitely a lifesaver for me! Question. You said you prepared with coconut milk. I hate the flavor of coconut. Do you have to use it at all? This was one of the best quinoa dishes I’ve found yet! Thank you for this new staple in my rotation!!! Oh my goodness, thank you so much for your incredibly nice comment! So happy you liked this recipe and that it’s going into your rotation!!! I’m so happy to hear how much you liked this dish, thank you so much for coming and leaving your feedback!! Hey Phi, love this dish and appreciate people like you who make it easier for people like me who love to cook! Boyfriend and I are enjoying this after a long and fulfilling day trip. Thank you! Just made this for dinner earlier tonight. I had to sub a few ingredients for what I had in the pantry, and it still turned out delicious. I also added broccoli. 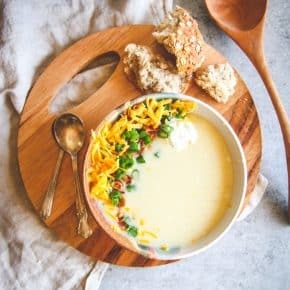 This is a great, quick meal as I am new mom as well, and I’m breastfeeding! I’ll be pinning this to make it again. Thank you! Hi There. I’m making this tomorrow, and I’m really excited. It looks and sounds amazing! Would you happen to have the nutrition break-down for this dish? I looked a couple of times, and I didn’t see it. Forgive me if it’s right there, and I’m blind, I haven’t been sleeping well. Thank you so much! I can’t wait to make this! I’m just learning to like quinoa, and this looks like it will speed things right along! I did make this tonight, and it was great. My guy and my child both want me to make it again soon. J is not a quinoa lover, and told me, “you pulled it off, this quinoa has really good flavor.” I liked it a lot as well, and will make it again soon. Thanks! Oh my goodness, so happy to hear that, so glad you and your family liked it! Sorry, I don’t have the nutritional breakdown! It was delicious anyway! Thanks!